In 1194, however, the entire building – with the exception of the crypt and the façade – was destroyed by fire. Construction work began on the Gothic cathedral, measuring 130 metres in length, soon after. The original floor included a labyrinth in the nave. Notre-Dame de Chartres was consecrated in 1260, and it was here that the coronation of King Henry IV of France was held on February 27th, 1594. The roof was destroyed by yet another fire in 1836. Notre-Dame de Chartres marked a turning point in the evolution of Gothic cathedrals. 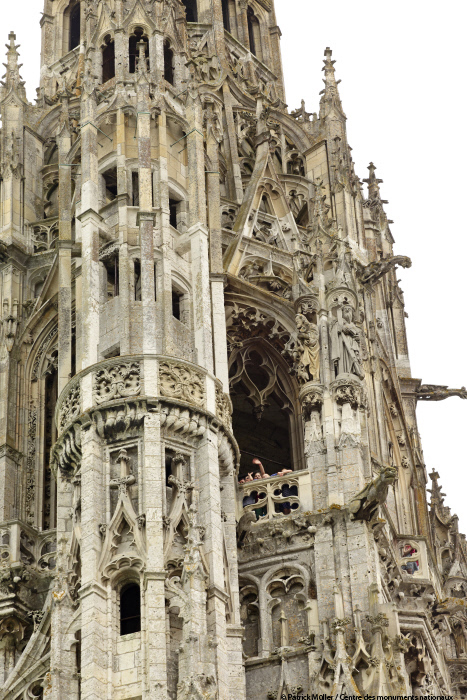 Construction on the cathedral began 30 years after Notre-Dame de Paris, heralding a new era of vast, vertical constructions and reflecting the hollowed-out wall techniques seen at Reims, Amiens and Beauvais. The cathedral retains its original stained glass windows and monumental sculpted décor of exceptional quality. It was listed as a UNESCO World Heritage Site in 1979. Unusually, Notre-Dame de Chartres has retained the entirety of its sculpted décor and stained-glass windows. The cathedral features a total of nine sculpted doors – three on each of the three façades of the building. These doors depict spectacular, instructive scenes from religious history. The royal door is a fine example of the column statue technique from the mid-12th century, with a single block of stone used as both a supporting structure and a decorative element. The doors of the transepts were sculpted shortly after 1200. There are a total of 150 separate stained-glass window panels, covering a total surface area of 2,500 m². The stained glass in the three window bays on the western façade dates from the 12th century, as does the “Notre Dame de la Belle Verriere” window in the choir. Most of the other stained glass windows date from the 13th century. They were made, at a not insignificant cost, using donations from corporations, bishops, princes and kings. The history of Chartres Cathedral is marked by a series of fires. The fire on June 4th, 1836 destroyed the “forest” (the sweet chestnut frame from the 13th century). The competition to rebuild the structure was won by engineer Émile Martin, who decided to replace the wooden frame with a more solid, durable and fire-resistant metal frame. It took six months to manufacture, transport and assemble. The frame is shaped like an overturned ship’s hull, with steep rafters that recall the broken arches of a Gothic building. This metal frame is one of the oldest examples of its type in France.